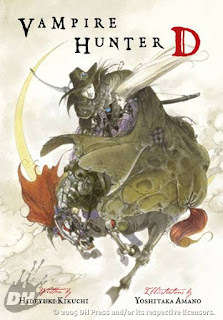 I've read Vampire Hunter D before and I remembered rather liking it the first time. So I decided to find out if it stood the test of time. Vampire Hunter D follows Doris Lang after she is bitten by the vampire lord Count Magnus Lee. Desperate to avoid the fates of the average victim, she enlists the services of a dhampir vampire hunter known only as D. They find that the vampire may not be their only obstacle to overcome however, as they must contend with the Count's elitist daughter, Doris' jilted suitor and a beautiful but sadistic bandit. Wow, rereading this put into stark detail just how low my standards used to be. There is a decent enough story buried in here, but there are just so many issues that make it really kind of incompetent. Where to start. I suppose I would start with the writing style, which just struck me as really stilted and overblown. How much of that is the fault of the translation or whether it was like that in the original Japanese I don't know, but it gets really distracting really quickly. Second, there is some fairly detailed world-building, involving a pretty decent mix of high-tech and medieval as part of its post-apocalyptic setting, and an interesting origin of supernatural creatures as a result of widespread nuclear war. Unfortunately, the author has decided that the best way to get that across is in huge chunks of information dumping text. I don't mind detailed back-story, but it tends to come across better when it isn't squeezed into as little a space as possible. Third, there are the characters themselves, who are more than a little unbalanced. On the one hand, we have our heroine Doris, who is meant to be both strong and independent with experience fighting the supernatural, but also have moments of vulnerability due to her relative age. What we actually end up with is your standard damsel in distress, whose combat abilities are so massively dwarfed by basically everyone they meet that she might as well not have them. Additionally, it is intensely aggravating for the narrative to basically imply that following the experience she is now totally defenceless and entirely dependent on her eight-year-old brother. On the other hand, we have the stoic vampire hunter D, who must battle with his own vampiric tendencies as a trade-off for his superior skills. What we actually get is a hero who is so massively overpowered that it removes any tension whatsoever from any scene where he is present. In particular the climactic final battle between him and the Count is sapped of any tension that it may have had earlier in the novel, seeing as the reader sees him bring himself back to life after being stabbed through the heart. If death can't stick for more than a couple of hours, then there are no stakes, it stops being interesting.